Ideal for use as a procedural chair or treatment table during mammography/biopsy procedures. The shortened base is easy to maneuver in small rooms with large imaging equipment. The backrest adjusts to a full upright position of 90 to facilitate mammography procedures. 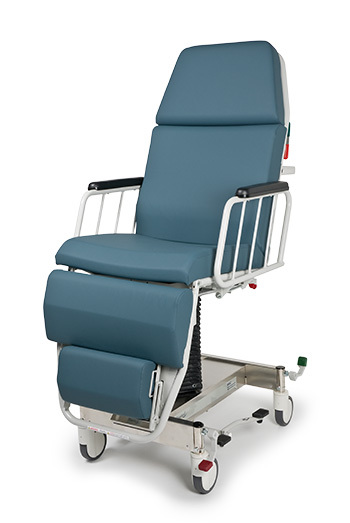 This unit adjusts easily from sitting to supine and provides a stable work surface during patient treatment. Pre-induction, transport, treatment, and recovery can be performed on the same unit to improve case turn-around and streamline patient handling in surgical care. 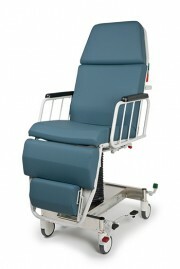 The chair’s versatility allows it to be used for pre-induction, transport, treatment, and recovery. Color is Spruce Green. 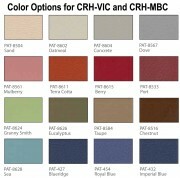 15 other colors are available for an additional $250 upgrade fee.